Born in Ohio in 1906, LuEsther T. Mertz was the youngest child of a Methodist minister and his wife. Inheriting her father's passion for education and literature, LuEsther trained as a librarian at Syracuse University. In 1953, LuEsther and her husband Harold Mertz along with their daughter Joyce founded Publishers Clearing House. Over the years, Publishers Clearing House grew from an initial mailing of 10,000 letters to a marketing legend. 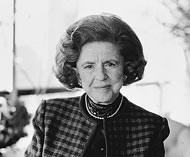 Mrs. Mertz was active in the company's management, serving as a member of its Executive Committee until her death in 1991. Mrs. Mertz and her family were dedicated supporters of culture, the arts, the environment, and human rights. In 1961 Mrs. Mertz founded Choice Magazine Listening, an audio anthology of magazine writing for the visually impaired. She went on to become a major supporter of Lincoln Center, the Central Park Conservancy, the New York City Ballet, the New York Shakespeare Festival, the Joyce Theater Foundation, and the American Civil Liberties Union. In her home community of Port Washington, New York, Mrs. Mertz served as a Trustee of the Port Washington Public Library and was a founding member of the Port Washington League of Women Voters. In recognition of her contributions, Mrs. Mertz was awarded the Mayor's Award for Arts and Culture in 1983 and the New York State Governor's Arts Award in 1986. In the 1980s, Mrs. Mertz became involved in programs in horticulture and science at The New York Botanical Garden, and she contributed greatly to the institution's revitalization. After her death in 1991, important gifts from her Estate and from the LuEsther T. Mertz Charitable Trust have contributed to core programs at the Garden in horticulture, science, and visitor services, as well as to the construction of the Garden Cafe and Terrace Room, an important visitor amenity that opened in 1997. The LuEsther T. Mertz Library is named in recognition of Mrs. Mertz's enduring commitment to the Garden, her dedicated support of the Garden's science programs, and her lifelong love of literature.